Pyle's Hydra series has the solution for your marine audio needs - this head unit is waterproof to IPX5 standards! 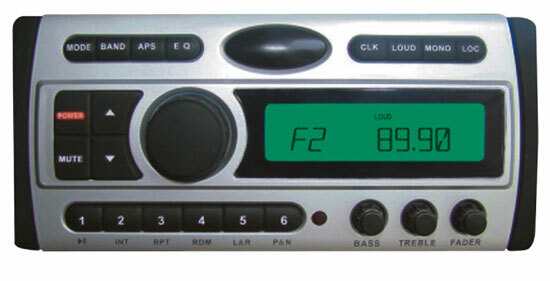 Designed to withstand salt and UV exposure, this unit capable of tuning AM/FM, playing audio and MP3 CDs, and streaming DVDs over an RCA video output. It's rated at 4 x 90 watts, so each speaker has plenty of independent power. And it comes with everything you've come to expect from a modern head unit: 3-beam laser tracking, anti-skip mechanism, loudness settings, and a 30 station memory. The LCD screen is backlit and shows relevant track information. A wireless remote control means you can change tracks without having to get up. Pyle's head units will have your music sounding great at the dock or in the middle of the ocean.